Do you ever need to fill a few minutes in class? Want those minutes filled with something meaningful? Also want those minutes to require very little (hopefully nothing) from you? Wouldn’t it be nice if those minutes incorporated some high-level thinking and schema cementing tasks? That’s where Daily Schema Review comes in. It is a SUPER flexible resource that contains plenty of tasks to use throughout the year. Everything you need to review a wide assortment of skills and concepts are all in one resource. Yay for simplicity! Used as an oral tool, Daily Schema Review is the perfect “starter” to conversations and group discussions. Teachers can display a topic and ask students to work collaboratively to elaborate upon possible answers. This not only lends to discussion and building verbal skills, but also to working together, listening to others and the strengthening the group conversation dynamics. As an independent or small group center activity, Daily Schema Review offers students opportunity to explore concepts previously discussed in class while demonstrating their acquired knowledge (schema) on various topics. 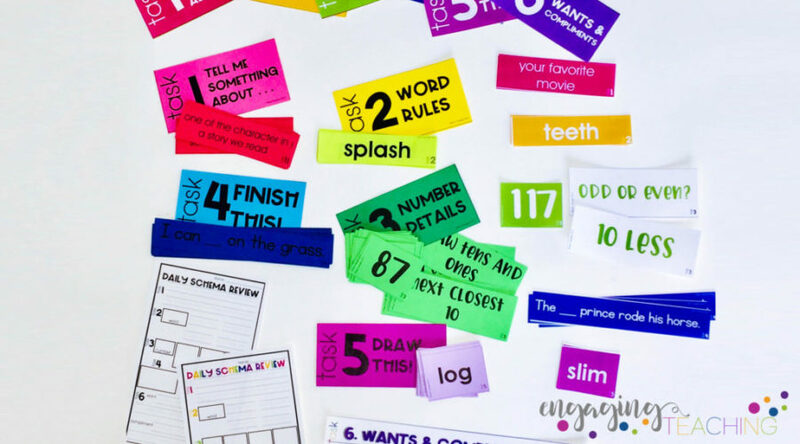 As a “time filler”, Daily Schema Review, offers students opportunity to work quietly on a routine task that requires little to know explanation after the routine has been instructed. This provides the teacher with opportunity to complete tasks or work with children 1:1 or in small groups, with minimal disruption, all the while knowing that students are engaged in a meaningful and skill building activity. As a “checking for understanding” tool, Daily Schema Review provides the teacher with information regarding student attainment of a given skill. This assists in building future lessons that will allow for further exploration of a topic or simply knowing that you can “move on”. As an assessment tool, collecting Daily Schema Review answer sheets provides teachers with an opportunity assess skills students should have mastered. They provide data on where students have achieved mastery and where they still need practice and instruction. The tasks are easily aligned with standards and can provide ample grading opportunities. There are 6 different tasks. Assign what you have time for on that given day. It could be all 6, it may be 1! There is no start or finish in this resource. Use the pieces in any order, as often as you wish. Choose to have students do one task a day, the same task a different way for several days, a few tasks each day – it’s entirely up to you! Once you’ve explained the expectation of each task, the kiddos know what to do and can get right to work. The expectations are simple but require some thinking and explaining. Yay for DOK and higher-level thinking! The tasks are designed so that they will look fantastic on your bulletin board and not take up too much space. Each component in this resource comes in full-color, black and white, and EDITABLE options! You can truly make it your own in every way! The task one cards are a large variety of “talking points”. These work great as day openers, call to the rug, morning meeting, etc. talking points. As a quick writing activity, students provide one or two quick sentences or words explaining something they know about the topic. Depending on the ability of the students, this can be simple or complex. Students identify phonic rules they notice in the word. A kinder student may notice it begins with the sound /b/ and that it has 2 b’s in it. Older students will note it is a compound word, it contains a “bossy R” digraph, as well as the th digraph. There are a lot of options with Task 3, Number Details. Daily Schema Review includes number and dot cards (shown green above) as well as question/guidance cards (shown white above). With the number card, they may answer questions like 10 more or less, the number +5, the number -5, odd or even, show tens and ones, etc. Finish This! is a sentence completing activity. Younger students fill in with a word that makes sense. Older students use vivid verbs and descriptive adjectives. There are a variety of sentences ranging in difficulty. Draw this is exactly what it says. A fun time-filler with this one is to have the kids compete for quickest, best, most improved, most creative, etc. drawing. This is a great brain break activity, too! There are no task cards for this part of the resource. The only expectation is their WANT has to be something that can’t be bought. For example, “I want to learn how to read all of my sight words this week.” “I want to learn how to ride my bike without training wheels.” “I want to try pineapple.”. One of the best parts of Daily Schema Review is that it can be used in any fashion! You can display it all or just a component or two, discuss the task cards or assign them 1 or several at a time. You can use it as a word work activity, or assign it as an assessment. Recording sheets (BW and color) are included. Copy and hand these out to your students. Or, laminate to card stock and provide wipe off markers for a reusable option. Likewise, using white boards to record answers is a fantastic way to save paper. I like to provide my kiddos with a paper to use on their clipboard. (Click here for the HOW-TO on these DIY clipboards!) They sit on the rug to do the activities I assign to them. They save the recording sheets in their “unfinished work” in their desk so they can reuse it throughout the week as they finish the tasks they are assigned each day. There are 3 files. One in full beautiful bright colors (they match the Vanilla Sherbet decor line! ), one in black and white (these look fantastic printed on colored paper!) and editable cards as well!! The black and white version on colored paper truly allows for individual style! Print on the colors that blend best with your classroom’s color scheme. The BRIGHT and light color version fits in perfectly in my classroom! There are 2 different title card options as well. Choose the style that best suits your classroom and bulletin board space! The included digital version is amazing! Each concept area includes a drop down with hundreds of choices. Additionally, you can edit the blank card to say anything you’d like! Concept review is paramount to concept mastery and schema retention. The Daily Schema Review resource is useful in many grade levels to aid in concept development, mastery and schema building throughout the entire school year! It is a fabulous tool to add to your daily or weekly routine. 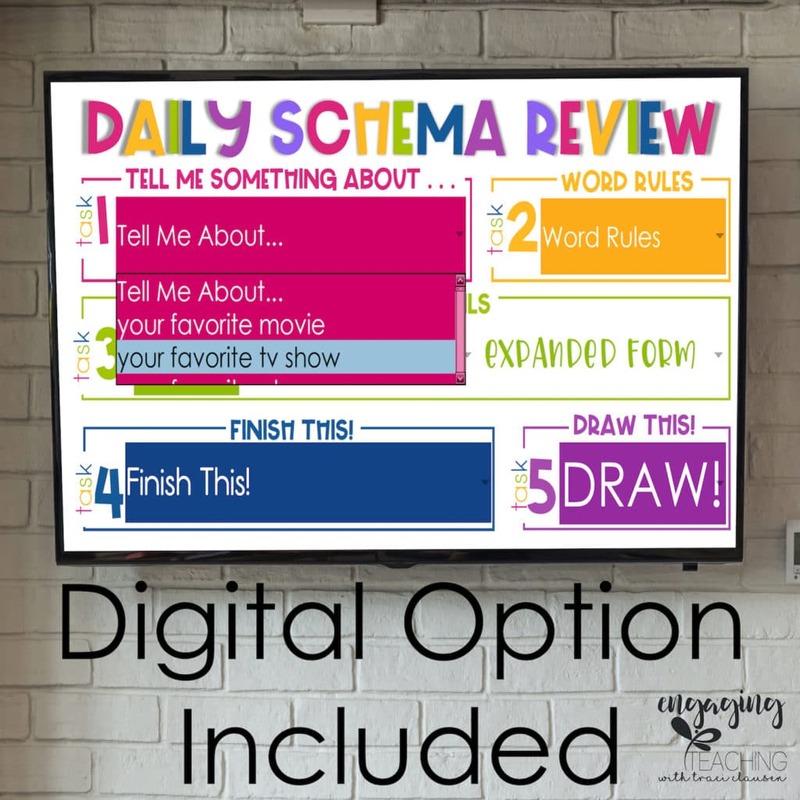 The best part of the Daily Schema Review resource is that each teacher can make it his or her own and use it in their classroom however they wish. It is easily adaptable, editable and suitable for many grade levels. ⭐Draw This! Cards – Utilize those phonic rules to decode words and draw the word shown. Daily Schema Review also includes a Wants and Compliments task where students build positive character traits and speaking, writing skills. Not only does Daily Schema Review offer ample opportunity to build and strengthen concept mastery, it provides extremely flexible ways to offer these opportunities. I love interweaving review opportunities throughout the week. It’s fun to throw up the concepts we worked on the previous week and just do some discussions about it with the kiddos – as in they discuss and I listen. They’re the teachers. I’m the student. They love it. A couple of my favorites are phonics/words and numbers because there are so many things the kiddos can point out about those things. What are your favorite review topics?